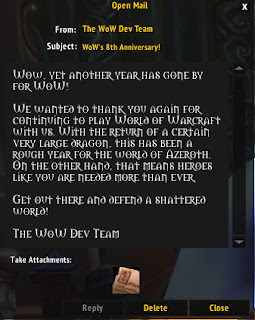 Normally I'm not one of those people who jump on the "Blizzard and WoW are really going downhill" bandwagon, but I just couldn't ignore this. Uh, what? A certain very large dragon? A shattered world? Did they just re-use the letter from last year? 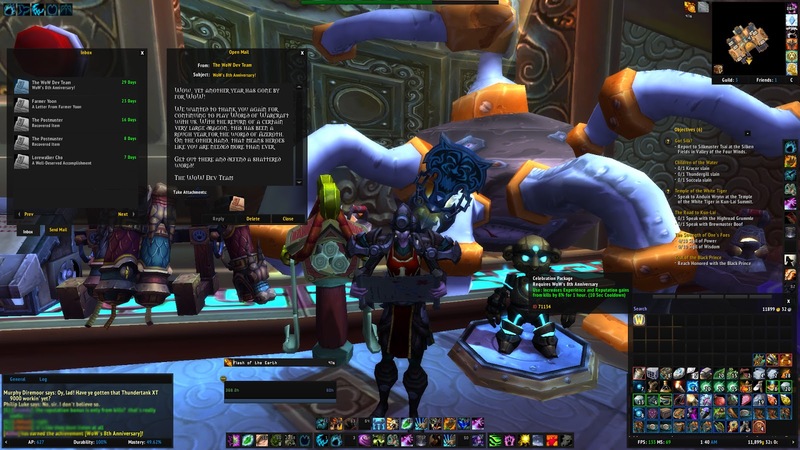 Oh, SQEEEE a rep item that is of little to no use to a level 90 toon. People who play this game generally act like they're entitled to a lot from Blizzard. We pay monthly for this service and sort of expect certain things. 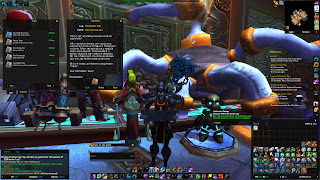 Maybe Blizzard was just spoiling us those years we got the pets. I just can't stomach this though. 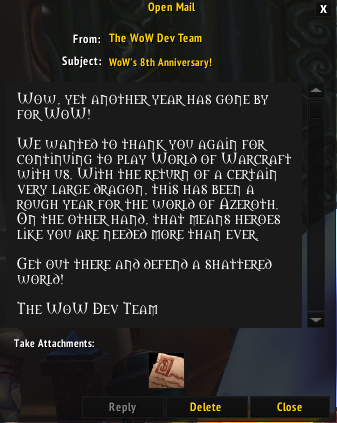 Re-using the thank you letter from last year is just a tacky slap in the face to players. What it really says is "Oh, it's our 8th anniversary already? Uh, sure we remembered! Here's this, uh, thing we whipped up just special for all of you people who have been with us all this time. We hope you don't notice the apparent apathy in our lack of effort! Stay subscribed!" Given that they still haven't fixed the misspelled Org portal in the Horde hub, I'm not holding my breath. It is sad, and I would have liked a new pet. Heck they could have just taken one of the battle pets models roaming around the world, given it a new name and flavor text, and done. Maybe one of the Mists ones?